Your guests will experience Chris and his incredible sleight of hand up close as he mingles throughout your cocktail hour. If you’re looking for the perfect ice breaker to get people talking, this is it. In between courses and during dessert, Chris will perform a mini show at each table. Forks will bend, playing cards will float, coins will appear and disappear. Your guests will talk about your event long after it’s over. Bar/Bat Mitzvahs, Sweet Sixteens, Weddings, and Anniversaries, Chris will create a unique atmosphere of mystery and excitement for any private event. Guests of all ages will be charmed and mystified by Chris’ warm personality and unique conjuring skills. Impress your important clients and amaze your valued employees. Chris’ magic and mind reading will make your next holiday party, sales meeting or corporate outing stand out above the rest. After dinner, Chris will step out before your guests for an evening they’ll never forget. His formal show includes magic and mind reading with lots of audience participation and an attention to the details of your special needs as host or hostess. Want to be the life of the party? Want to impress your friends, clients, and family? Chris offers one-on-one magic lessons via Skype. You will learn the secrets of magic from a master in his field with lessons that are customized to your individual needs. Spice up your holiday party with Chris’ amazing magic show! His unique tricks are great for all ages, expect a barrage of creative coin and card tricks as well as a mystical display of mentalism! Ideal for birthday parties and Bar Mitzvahs too! Everyone loves having their fortunes told. Palm and tarot card reader Kimberlie Naughton will amaze your guests with her accurate readings. Be sure to ask about this unique service and receive a package deal when hiring Chris and Kimberlie together. Chris Deleo’s interest in magic began at the age of twelve when he saw a magic trick demonstrated for him at a local magic shop. He immediately bought the trick and rushed home to show his friends and family. So began his life long passion for performing magic. Years later, Chris realized the hard work required to turn “tricks” into MIRACLES. He studied the art of showmanship and developed his skills to a point where his fellow magicians began to take notice. Chris is regarded by his peers as an elite sleight of hand expert, an artist who cares deeply about his craft. Chris decided to make Magic his full time profession after more and more people began hiring him for private events. He left his career as a draftsman at an architectural firm and jumped into the often unpredictable world of entertaining. It was a decision he would never regret. 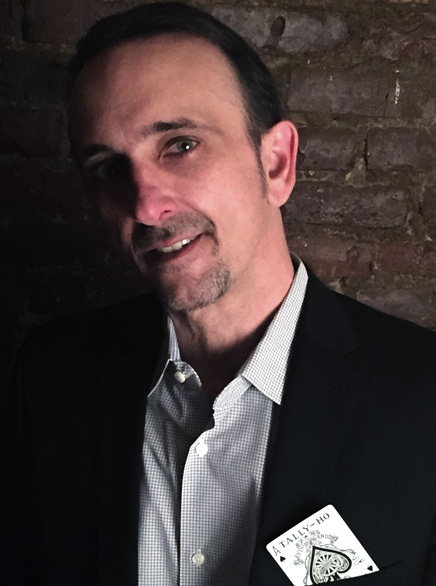 Chris Deleo measures his success by the powerful impact he creates on his audiences. His performance goal is simple: Give people something incredible to talk about and remember. Armed with this credo, Chris goes the extra mile to offer his clients something rarely experienced: Powerful Magic! Several thousand Instagram followers can’t be wrong. Chris designed his Instagram page to showcase his love of magic and sleight of hand. People responded. He is often asked for advice by up-and-coming and experienced magicians alike. Chris believes in sharing his knowledge with anyone who is sincere about their interest in magic. Traveling extensively and working nonstop for corporate and private clients has turned Chris Deleo into New York City’s premier magician and mind reader. Want to book Chris for your next event? Contact him today! Want to learn more about magic? Check out Chris’ blog and talk shop about magic, mindreading and more! Want to book Chris for your next event? Great! Please complete the contact form and leave a detailed message about your event. Chris will contact you as soon as possible, thank you!